Are you a first time SaaS entrepreneur targeting the US market? 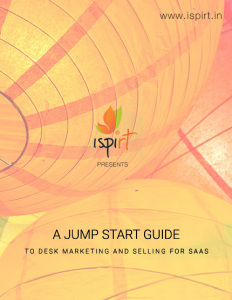 Learn it from the masters through the Jump Start Guide to Desk Marketing and Selling for SaaS put together by Krish Subramaniam (Chargebee), Niraj Ranjan Rout (GrexIt), Sahil Parikh (Brightpod), and Suresh Sambandam (KiSSFLOW). Aaron Ross launched the guide during the first SaaSx event in Chennai put together by iSPIRT, attended by more than 100 SaaS entrepreneurs. The following are the take-aways. Use the guide to understand in-depth and develop your strategy to hit $100 million in sales. All the very best! There are four different strategies employed by Indian entrepreneurs for customer acquisition: Learn from Wingify, KiSSFLOW, GrexIt, Freshdesk. Free trials don’t work for higher sales value. And prices are not listed publicly by most companies. What is the right pricing? There is no one sutra to it. But get it right before you push your sales pitch. Learn strategies from the hackers who did it before. Have a team in place to handle marketing efforts with clear segmentation of the team: marketing/product/sales. Have clear-cut roles as they often blur. Understand the 10 recommended activities before you start marketing. Learn how to build content around long tail keywords for effective SEO. Marketing based on content generation (content marketing) has many dimensions to it. Use all of them for maximum benefits. Social channels ensure better outreach. Make your presence felt on social pages. Retarget your customers who just dropped by your website. You can innovatively market using your product itself. Get a marketing team in place. There are some sales channels you must ignore before starting the SaaS company. Learn what catching, coaching, and closing mean. Winning the first few customers is the founder’s job. Learn what tools to use for customer development. Facilitate self-selection and build engagement with the customers. Collect key information during the engagement process. Post-trial offers work for closing the customer. Learn the customer closure techniques to use. Structure your sales team clearly. Doing a great customer service after sales is essential to retaining the customers. Learn the tips. This Thursday evening will witness the largest gathering of SaaS founders in India. In the event conceived by iSPIRT called SaaSx Chennai, more than 100 people, largely SaaS founders, apart from a few handful of product industry influencers, will brainstorm on various aspects of a SaaS business, especially taking the SaaS organization from a $10 million revenue to a $100 million revenue. Girish Mathrubootham, CEO of Freshdesk, talks of Aaron Ross, the author of Predictable Revenue, as the brain behind Salesforce.com’s recurring $100 million revenue year on year. He initially started a company, raised $5 million, burnt the whole cash, and shut down the company. Then he joined Salesforce.com as a cold caller. Finding cold calling to be a bit arduous in winning customers, he conceived what Girish calls Cold Calling 2.0. His idea was to first interact with the customer on email and then establish a rapport, before calling the customer. The idea behind this exercise to first zeroing in on the most suitable customer for your product. This turns the prospect into a paying customer quickly. At SaaSx Chennai, Aaron Ross will deliver the keynote as SaaSx via video and will release the Jump Start Guide Desk Marketing and Selling for SaaS, co-authored by Suresh Sambandam, founder of KissFlow, Krish Subramaniam, co-founder of ChargeBee, Niraj Ranjan Rout, founder of GrexIt, and Sahil Parikh, founder of BrightPod. Suresh says the event was conceived on the lines of SaaStr Conference, hosted by Jason Lemkin. He attended the event in San Francisco this February. Buoyed by the 300 to 400 founders coming together from all over the world in SaaSter, he wanted to bring together the SaaS founders in India. SaaS companies are witnessing phenomenal growth all over the world, and India is also seeing an uptick in this sector. Chennai is emerging as the SaaS hub of India, thanks to six big companies that are running their operations here. There are startups emerging as well. “Just two days after we announced the event, 65 signups happened and SaaS founders were excited by the idea,” says Suresh. “In a focused event, founders can discuss real problems,” says Girish. A conference of a general nature does not give a beneficial take-away for an entrepreneur. “The idea is to bring similar people at similar stages of growth and discuss their pain points,” says Krish of Chargebee. He says cross-learning from each other will be useful in solving many problems the SaaS entrepreneurs face. “Even before the event, many one-on-one meetings are happening among SaaS entrepreneurs,” says Krish. The event will have four parts. A My Story session with three SaaS founders, followed by an open house on Anything and Everything on SaaS moderated by Girish, aided by Suresh and Krish. I am a big fan of Joel On Software blog & FogCreek Software. Yesterday Joel announced that, Trello, their visual Project Management product, is now an independent venture funded entity, spun off FogCreek Software. One of the comments in HackerNews caught my attention and got me thinking about an issue — how do you decide if your product idea needs external funding or not?. How do you decide if you should bootstrap to profitability or raise funds at the beginning? There is always an ongoing debate of raising venture funds vs. bootstrapping your way to profitability and sustained growth. There is 37signals and Zoho school of thought to bootstrap your way to success. And then there is SalesForce at the other extreme. There is no generalized right or wrong answer to this question and very often you find startups challenging these norms. There are a few aspects like competitive landscape, market trends and the adoption curve of product itself, that can guide you to make this decision. So, what are those? Bootstrapped model: If you are in an established (read commoditized) market with lots of competitors it makes sense to build your way to profitability by bootstrapping. If you are building yet another Mailchimp competitor, solving “bulk emailing” for a niche ignored by them, and solving it elegantly while building your way to profitability may be the best approach. Venture funded model: If you are in a new market with lots of business model or technology innovation happening around it, you should try to build / grow as fast as you can. At Chargebee, we are in this category with a fast changing Subscription business model that is disrupting the way you think about customers & sales, and creating new growth opportunities across sectors. In the case of applications like CRM, you always evaluate something like SalesForce though you may like a Close.io or a Pipedrive. And you tend to hear opposing voices within your team, advising you to choose an established solution because “it can scale”. By scale, they mean feature richness, integrations, small aspects of product features that makes every day life easy — the benefits of being in market for years & having fixed nagging issues for customers (ex: SalesForce automatically creates follow-up tasks based on rules. It is a simple thing, but I have repeatedly seen this being a reason for sales managers to choose this because it is important for them). Though you can get funded as a new player in the CRM space, it takes years to challenge the established player unless you are complimented by market forces. Ex: Cloud + Behavioral Analytics + Inside Sales could be a game changer & could leave SalesForce behind. Let me explain. If behavioral analytics becomes the key to doing sales in SaaS (like it is now), established products like SalesForce can be challenged by players like Intercom that provides a totally different dimension to doing online sales and they can dominate that market. Everybody else in CRM space, playing by established rules is trying to play catch with the leader and not disrupting in a big way. This is one category. Another category is one in which the market leaders are not well established, yet. The market itself is being defined by new way of doing things, across several verticals and products are still maturing. The early mover is even probably at a disadvantage making mistakes along the way, building & rebuilding stuff while lots of new players are emerging building better solutions (this is the space we believe we operate in with Subscriptions). The comment in HackerNews resonates well here with the second category explained above — the opportunity probably missed by Kiln & Copilot, when they could have totally dominated the market. Github totally dominates the market. Kiln probably missed the bus by not moving fast with Git & SaaS model. If they had deep pockets, they could have been the market leader taking on Github. And they sensed the opportunity early with StackExchange and now Trello, and have spun them off into separate entities off FogCreek, so they can thrive on their own. Both these models work and there are always exceptions (isn’t that exactly why we startups exist, to buck the trend?). Choose whichever suits your style. But if you are in second bucket, we should be aware that competitors may take the market further away from you, if you don’t do justice to your startup with right resources at the right stage.